When BMW was thinking about this series of vehicles, they did not want it to have just one design or body style. There are actually three different body styles which includes the Gran Coupe, ALPINA B6, and Gran Turismo. This gives you a lot of options when it comes to the style and even the features of the vehicle. 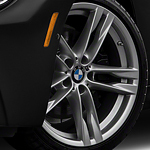 If you want a vehicle that not only looks good but has a lot of power in its performance, then we at Grand Blanc Motorcars can give you that with the BMW 6 Series vehicles. We will show you the different features and how well they work when you visit us.